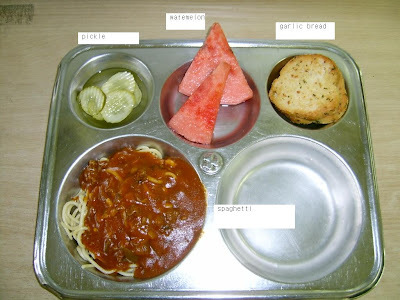 What's interesting is, you would find this same meal in any American school, and perhaps anywhere in the world, spaghetti is just universally popular. I'm in Korea now and the garlic bread is usually sweet. The spaghetti is usually more chili-like and chunky. Not bad just different.